The Tardis takes the foursome to the welsh mining village of Abertysswg in 1902, just in time to save most of the miners from an all too frequently occurring tragic accident in the mines. Sadly not everyone makes it out alive and the news must be broken to the wife and Mother of John Hughes (Tim Treloar) and Gwyn Hughes (Matthew Aubrey). But when it is down to Kamelion to break the news, something unfortunate comes over him that brings confusion into the mourning villagers and puts at risk some of their number. Will a decades old secret prove deathly after all these years? This is a wonderful lesser known incident in history to pick up on and one that typifies the often forgotten dangers of working in a mine in days gone by here in the UK. 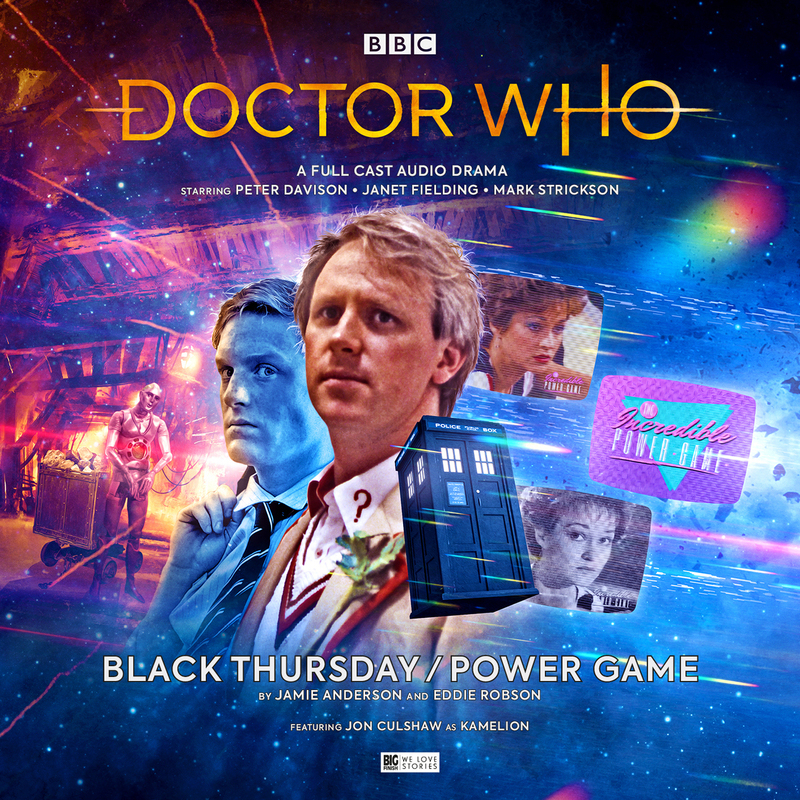 The drama is nicely written and the characters feel real as does the mob mentality that inevitably starts on the strangers in town that are the Tardis crew. This feels ripped from an 80’s Doctor Who, maybe even with the characters drawn even more strongly. Tegan has been getting some delightful zingers in the audio adventures lately as well as finding some more complexity in the relationships within the Tardis. This is nicely aided by Kamelion being added to the recent releases. Kamelion is missing, The Doctor & Turlough are looking for him in 80’s England with no clue of where he might be and Tegan is on a sci-fi concept game show that she doesn’t remember signing up for. Can this all be linked? And is it really just a game? A very nice change of pace from the first more dramatic story to one that’s more fun and light hearted. I was instantly reminded by “Power Game”, the game within this story, of Knightmare, a childhood favourite of mine. This is a great slice of the 80’s in general and one what calls to mind a story that, like the first, could easily have been in the original Davison run. There is a team of sci-fi and fantasy fans in this story that will be very familiar to most listeners. They have some fun with these characters, but I feel it’s a mark of respect that it’s some geeks that help the Doctor save the day this time. As this is in a lot of ways a Kamelion light episode, it’s a good story for Tegan and Turlough. Another really strong release and I’m still enjoying looking into the Kamelion era of Doctor Who. A time I never would have realised I wanted explored more, but here we are! I must admit to wanting the next story to veer a bit more away from Kamelion being taken over by those around him. Yes, this is wired into who the character is, but let’s see something else from him too. But as it stands these stories do something a little different with his shape shifting abilities. It does seem from the trailer included in this release as well as a cliffhanger ending we will indeed get something new from him next time out. This does for me feel like the iconic version of the 5th Doctor. Written and acted to the best strengths of the characters and directed so as well by Big Finish stalwart Ken Bentley. It’s a great reminder that as wonderful as the big name, big event releases are; Big Finish and Doctor Who can be just as entertaining with a couple of smaller stories. 9/10.